Baxter was named after a Puritan minister, and I am faintly amused by this memory when I hear him yowl through the bathroom door or when his claws clumsily scrabble across our faux‐wood floor. He is not quite as cute now, in the sense that his kitten‐like actions are more coördinated though less graceful and less innocent. Playful nips at our fingers now threaten to break the skin, and my wife’s voluminous exercise ball was unceremoniously deflated yesterday by a single lancing stroke of his paw. I watched her own expression fall with its rapidly flattening contours of texture, and I could sense in her a momentary disappointment in Baxter. She forgave it easily. She has always been the benevolent one, my Elisabeth‐full‐of‐grace. Before we were married, before she moved into my little row home in the inner city, I’d watch the alley cats in our neighborhood backlot with guarded disinterest. I’d shoo them away, back among the overgrown morning‐glories and soda cans and potato chip bags. Elisabeth? She was in the house less than a week before the small herd of strays learned to diligently gather around our back door and mewl in anticipation of being fed by her hand. The neighbors laughed. Dwight, the toothiest and most charming of our hard‐won local friends, smiled mischievously and asked, “You know what happens when you feed ’em, right?” We found out two months later, surprised by small eyes peering curiously through a gap in our backyard siding. My wife wanted to adopt the kitten, and I did as well. She thought he was cute and didn’t want him to die in the chaos of urban life. I thought about how the last litter died on my doorstep, that same doorstep, one year earlier. That was how we got Baxter. That was how we stopped feeding the other cats, mainly because I said so, which was mainly because I felt guilty. We were feeding and sheltering and buying toys for an animal when our neighbors were collecting food stamps and selling drugs just to survive. But most of them had pets too, I reasoned; they had big pit bulls and Dobermans, and Rob across the street mowed our lawn to make money to feed his dog, so it seemed alright to me. And Baxter brought so much joy to my wife, how could I not love him? When she cooked dinners for our neighbors, baked cookies for the kids on the block, and let her beautiful maiden form rest with me in our crooked and leaky and moldy row home, how could I not learn to love the way she loved? Elisabeth made our house a home, and Baxter made it family. When gunshots and sirens outside startled him, we gave comfort even as our own souls shook, even as we were inexplicably assured by his trembling, fragile being. So when the alarm company called us in the middle of the day, when we raced home to find the upper window forced in and gaping wide, it changed me. I felt the strangeness and hostility of the city all over again. As we followed the police in and I watched my wife rush through the house, the cold alarm in her eyes almost unrecognizable, I found something new had entered our home. I found betrayal, for everything I had learned to live and love and trust these two years in the inner city had become undone. My wife, she found Baxter. He scratched me and drew blood. That, I could forgive. I really enjoyed this! I’m glad Baxter was ok. That’s scary. There’s such a mix of people that I love in the city but the ever‐present possibility of something like this happening taints the security. I still miss it, though. 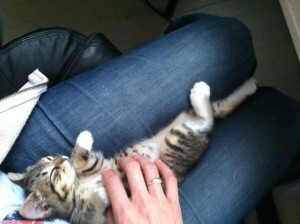 Congrats on your “kitty acquisition.” A pet adds so much to a home. I also enjoyed your piece! The city is a dangerous place for both animal and man. Your story illustrated that well. Glad Baxter is okay. When I lived in the City I was never afraid of home invasion, but in the suburbs it’s definitely on my mind. For this reason, I often daydream about moving back to my third floor apartment. I enjoyed the arc of this story. Thank you for sharing! What I love most about this piece is how your love for your wife and her character shine through. You made me love her too. Glad Baxter was safe!